'Pumpkin Week' returns to Hatton Adventure World! 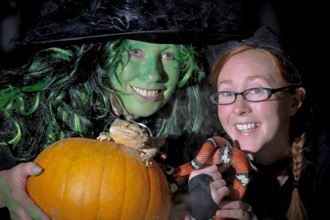 The popular Pumpkin Week returns to Hatton Adventure World from 21 - 29 October. Children can visit the popular family attraction to pick their own FREE pumpkin, carve it in the spooky decorated Marquee and then enter the best carved pumpkin competition to win a host of prizes. Brand new for this year is the Mystifying Halloween Show with scary capers and ghostly antics to entertain children of all ages with Zoobee, the resident entertainer. Also new for this year is Haunted House and Laser Combat Game - Zombie Run for those aged over 8 years. The Mega Maize Maze, which opened in the summer made out of corn and measuring over 3 acres, has had a spooky facelift and manifested itself into a Terrifying Terror Maze with 6 new hidden spooky characters. It will be open at timed slots each day throughout Pumpkin Week with plenty of spooky hauntings and ghostly activity. Plus there are rides on the Bewitching Trailer, Magic & Mayhew with Agnes the Witch around the cauldron plus all the usual Hatton Farmyard Activities! Carron Smith, Marketing Manager at Hatton said "With the night's drawing in, the weather turning chilly and the clocks going back, it's that time of year when Hatton goes full on Spooktacular with our Terrifying Terror Maze, Mystifying Halloween Show and plenty more ghostly goings on!" Hatton Adventure World is home to over 300 farm animals including rare breeds, plus an indoor play barn, adventure playground, falconry displays and much more. The entry all-inclusive price takes away the worry of finding any hidden extras. All the activities are included in the entry cost. Discounts are available online if booked in advance. Hatton Adventure World is open every day throughout the year (excluding Christmas Day and Boxing Day) from 10am to 5.30pm. For more information please visit the website at http://www.hattonworld.com/adventure-world or telephone 01926 843411.